Reupholstered in Great Plains mohair. 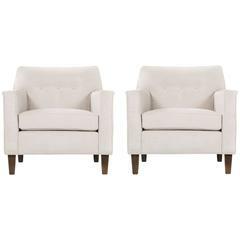 Wormley for Dunbar, classic pair of lounges, features; solid brass tapered legs, reupholstered with great plains woven wool blend. Price is for pair. Wormley for Dunbar pair of lounges, rebuilt and reupholstered with great plaines cotton velvet with walnut legs and tufted buttoned backs. A pair of generously proportioned pillow back chairs with front casters and original upholstery.